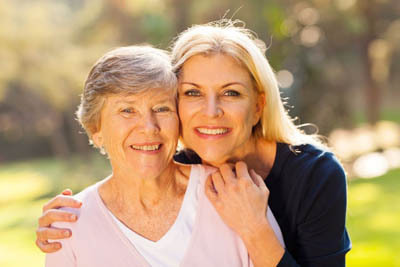 If you have a relative in our Assisted or Independent Living Senior Apartments at The Wesley Community, then you know just how important regular visits are to lifting your loved one’s spirits and staying connected. In fact, recent scientific findings suggest that these visits from family and friends may actually increase elderly adults’ quality of life and lead to fewer health conditions. Sit-down visits and heartfelt chats shows your loved one just how much you care, but they don’t always keep you or your loved ones entertained. If your routine visits are getting stale, it may be time to introduce some action! You may be surprised just how much time assisted living residents spend indoors. Although The Wesley Community offers gardens, courtyards, benches and patios on grounds, residents use them sparingly. Often times, residents get used to a daily routine and neglect to incorporate outdoor activities into their day. Next time you visit, try suggesting you and your loved one go for a short walk on the grounds to relax in nature and soak up some much-needed Vitamin D. If your relative is so inclined, you may even consider traveling to a nearby park for a change of scenery and great people watching. Depending on the facility and your loved one’s physical condition, elderly relatives may no longer be able to cook and enjoy their favorite food. If your relative is missing out on an old family recipe, try bringing a homemade meal to them, instead! Your loved one will appreciate the effort and you will both enjoy the opportunity to share a home cooked meal like old times. Not a cook? The Wesley Community proudly offers Georgia’s Restaurant where we welcome family members to join with meals. As our relatives get older, when it comes to keeping up their physical appearance, like grooming their hair or primping their skin, many find they don’t have the time or the means to keep up like they used to. Inviting your loved one to join you on your trip to the hair dresser, manicurist, or massage therapist can provide a much needed boost to their mood and confidence. Pampering is an important component to emotional and physical well-being, and when made a group activity, an unforgettable bonding experience. The Wesley Community does offer a salon on premises. Did you ever hear an old song on the radio, or see an old photo of yourself, and were instantly taken back to that moment in time? For your next visit, try bringing your loved one personal items of theirs with significant meaning, such as your loved one’s favorite music records, movie, or old family photo album. You’ll find that these special objects spark many long-forgotten stories and memories that keep the conversation new and engaging. In addition to the new stories you’ll hear, you’ll get to see the joy on your loved one’s face when you reunited them with their favorite pastimes. Did you know that spending time with animals has been found to reduce blood pressure and stress, and even prevent depression in elderly adults? Just as family visits can have a positive affect on your loved one’s mood, so can a visit from a furry friend. A short visit interacting with the family cat or dog commands your loved one’s attention, and for a moment distracts them from their aches and pains. The Wesley Community is a pet friendly community. Regular visits from family are greatly appreciated, but what’s often forgotten is bringing your loved one to you. Now that your loved one may live farther away, or in a different part of town, it’s important to continue to include your loved one in family gatherings like birthday parties or holiday celebrations. Participating in family traditions and visiting familiar places can bring joy to both you and your loved ones. Make the most of your visit by taking pictures and sending the prints to your loved one so they can relive those memories and display in their apartment. The Wesley Community tries to keep our residents happy and healthy with a full social calendar. These events are a great opportunity for your loved one to show your family off to their social circle and so you can meet the friends and residents your loved one so often talks about. Transitioning your loved one into an assisted living community is like helping them move into a new neighborhood—get to know the neighbors and be involved! Whatever activity you choose, remember to first call ahead and ask your loved one if they would be interested in the activity. It’s also best practice to check with your loved one’s schedule so you do not conflict with mealtimes (unless you’re joining them!) or appointments. We hope these stimulating activities will entertain both you and your loved one and provide opportunities to create new long-lasting memories! If you are passionate about working with seniors, Wesley Health Care Center has many opportunities. Get your career started by viewing available jobs and applying online. Assisted Living Website Design and Development by Mannix Marketing, Inc.